Critically acclaimed, award winning ... commercial failure. It is the game you meant to play but didn't until it became hard to find and fell off the shelves, another single wailing the bargain bin blues: Grim Fandango. The crime noir, jazzy, art deco graphic adventure came from a hazy era when LucasArts' catalogue was more substantial than a long list of Star Wars titles, and the ever familiar shooters of today were only beginning to get really popular. The adventure game genre was in its death throes, and Grim Fandango was its last horseman. Achieving near universal praise in reviews, the game scooped at least nine awards within the year, including Computer Adventure Game of the Year (1999, Academy of Interactive Arts & Sciences) and Adventure Game of the Year (1998) from both IGN and GameSpot. Grim Fandango was destined for a ticket on the Number Nine. "That's our top-of-the-line express train. It shoots straight to the Ninth Underworld, the land of eternal rest, in four minutes instead of four years. But very few people qualify - let's take a look at your records." However, the sales records did not match the praise; numbers have varied widely over the years, ranging from nearly 100,000 to just shy of 500,000. 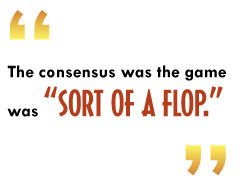 Still, early on the consensus was the game was "sort of a flop." As many gamers eventually left their hearts in Rubacava and moved on, a dedicated fan community picked up their walking sticks and decided to wander around instead of heading straight for the Underworld, establishing homes for gamers who still gather to discuss a game rapidly reaching its 10th anniversary of release. One virtual waypoint for the community is the widely popular Grim Fandango Network (GFN). Since 1998, the site has served as community central, site host, curator and news portal for almost everything Grim Fandango related. Founded approximately four years ago, the Department of Death (DoD) takes a slightly different approach by focusing on fan art, fiction and other original content. Ryan Williams (current webmaster, GFN), David Eggers (former GFN webmaster), James Isaac (founder, DoD) and Matthew Smith (from GFN hosted site Nightlight Productions) took time out to chat with The Escapist about the game whose community refuses to let it die. "[Grim Fandango] was pretty much a case of love at first sight," says Williams, who cites Glottis among Grim Fandango's "incredibly memorable and loveable characters" as a favorite. "There's something very compelling about a giant, orange demon that has a gentle heart and unwavering loyalty. He's also very funny, providing a lot of the game's comic relief." Salvador Limones fan Eggers speculated a bit on the longevity of the community and its fansites. "The major LucasArts adventure-related sites seem to be very long-lived generally, and I think it's a testament to the kind of games that company put out in the 1990s. It's definitely easier to keep a site going when you know it is being visited and read, and people seem to just keep showing up."